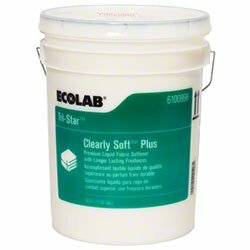 ECOLAB Tri-Star Clearly Soft Plus Fabric Softener. This product gives sheets and towels a longer lasting freshness and luxurious softness. Used encapsulated technology that brings a fresh and light fragrance from laundry room to guest room! This listing is for one (1)- 5 gallon bucket container.